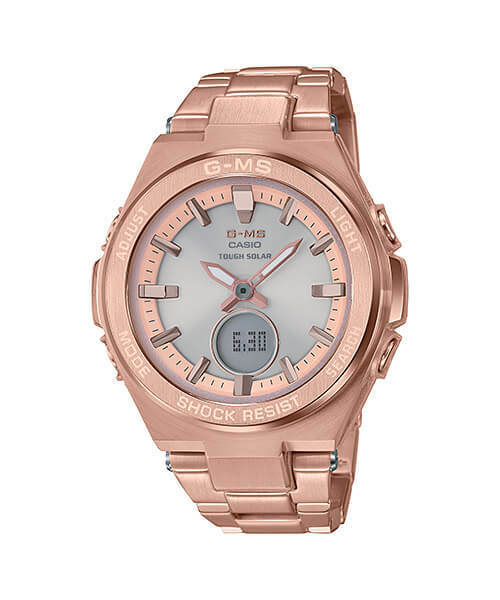 The Tough Solar-powered Casio Baby-G MSG-S200 series gets the metal treatment with the launch of the MSG-S200D series which includes the MSG-S200D-7A (silver) and MSG-S200DG-4A (rose gold a.k.a. pink gold). With full stainless steel bands, these models offer an even more upscale-oriented option for the refined analog-digital series. Standout features of the MSG-S200D-7A and MSG-S200DG-4A include stainless steel bodies and forged stainless steel bezels for extra hardness, Tough Solar power, and a relatively slim profile (47.5 x 38.4 x 12.2 mm). 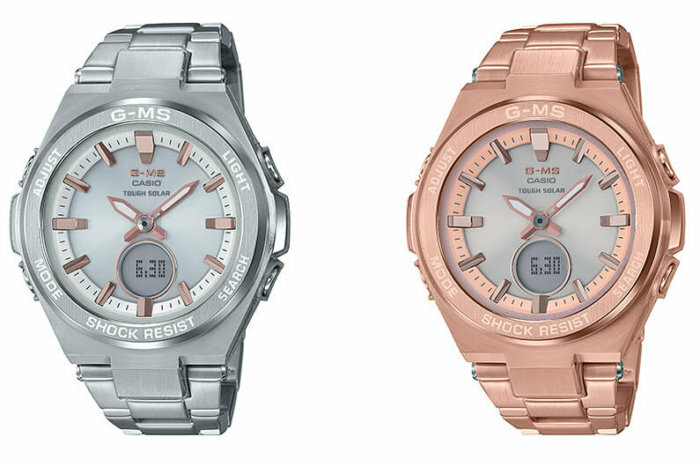 As part of the Baby-G “G-MS” line, these watches are fully shock-resistant and also water-resistant to 100 meters, making them appropriate for both work and leisure. Other features include Neo-Brite luminous hands, world time, 1/100 second stopwatch (59’59.99” total with elapsed, split, 1st and 2nd place), countdown timer (60 minutes total), daily alarm, battery level indicator, and Super Illuminator LED light with afterglow. The rechargeable battery lasts up to 11 months on a full charge without further exposure to light, and up to 20 months if stored in total darkness with the power save function activated. The MSG-S200 and MSG-S200D watches are the only current solar-powered Baby-G models outside of Japan. The MSG-S200D-7A and MSG-S200DG-4A are scheduled for an August 2018 release in Asia. 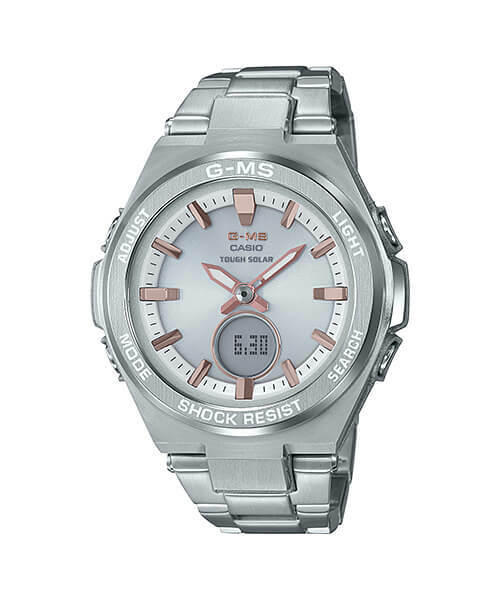 Update: Casio America is releasing the MSGS200D-7A (list price $200 USD) and MSGS200DG-4A (list price $240 USD) under the G-Shock brand. Silver stainless steel body and bands with a white dial ring and rose gold hands and index. Rose gold stainless steel body and bands with a pink dial ring and rose gold hands and index.